HONOLULU – The Hawaii Department of Transportation (HDOT) alerts Oahu motorists that the westbound H-1 Freeway will be closed between the Makakilo Drive overpass and the Kalaeloa Boulevard overpass on Sunday night, Jan. 27, 2019, through Friday morning, Feb. 1, 2019, from 10 p.m. to 5 a.m. Crews will utilize the westbound lanes to pour concrete for the roadway leading to the new bridge. Westbound motorists traveling on the H-1 Freeway will be directed to Makakilo Drive via the Makakilo/Kapolei/Kalaeloa offramp (Exit 2) and may continue on Farrington Highway/Kamokila Boulevard, Wakea Street, and the Farrington Highway onramp to return to the westbound H-1 Freeway. See detour map below. 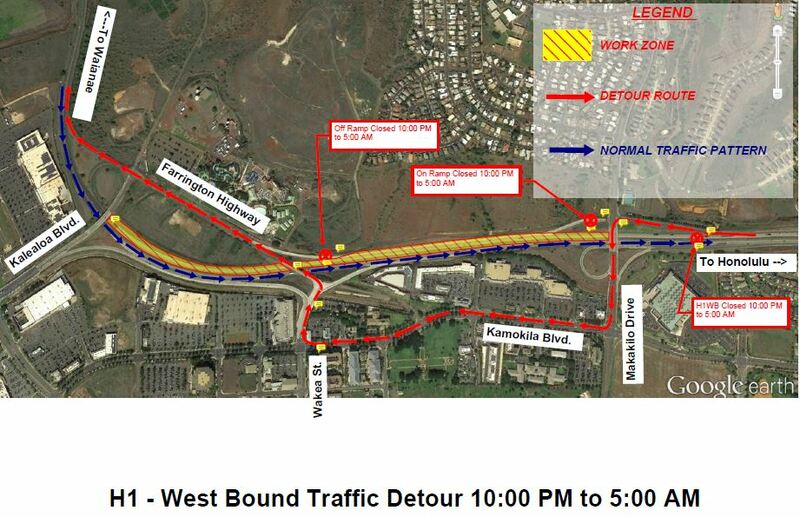 Future closures of the H-1 Freeway will be required in the eastbound direction. Notice will be sent out prior to their scheduled date.